Nashville, TN (April 4, 2012) – Country music Icon Dolly Parton just released her latest project, “An Evening with… Dolly”, which is a two-disc DVD/CD set available exclusively at all Cracker Barrel Old Country Store® locations. The double-disc set includes live performances of Dolly’s biggest hits, including 9 to 5, Jolene, Coat of Many Colors, Here You Come Again, Islands in the Stream, and I Will Always Love You, among others. The package retails for $11.99 and is also available online at www.crackerbarrel.com. Cracker Barrel has seen an influx of Bluegrass, Old Time Gospel and Classic Country stars in recent partnerships in the last few years, much like the Starbucks Music Marketing concept, Cracker Barrel is both a restaurant and a store and is very popular with fans of down home food and down home music. Most recently, the most award winning Bluegrass duo, Daily & Vincent, has been successful with Cracker Barrel promotions. I’m jealous of Dolly’s guitar on the cover. It looks like a PRS SE single cutaway hollow body, but, it could be a custom build. If anybody knows, let me know. The price point of the DVD-CD combo is ridiculous. Everybody should have a copy of this. Dolly started with promotion this week on Nightline and Inside edition and has upcoming appearances scheduled. Friday April 6th, catch Dolly online for a special one-on-one question and answer session with Billboard.com as well as on the entertainment news magazine show EXTRA! Saturday, April 7th, Dolly sits down with Rebecca Jarvis on CBS This Morning and Katie Cook for CMT Insider. On Wednesday, April 11th Dolly will be featured on the mid-day syndicated The Better Show. On Saturday, April 14th Dolly sits down with Governor Huckabee for Fox News Channel’s HUCKABEE. The show will re-air on Sunday, April 15th. In the coming weeks, Dolly Parton will also appear on ABC’s The Revolution with Tim Gunn, The Dr. Steve Show, Lifetime Television’s national morning show The Balancing Act, among others. On the same date, a major announcement came from one of the last true rebels, and I wasn’t talking about Hank III, I was talking about Junior! 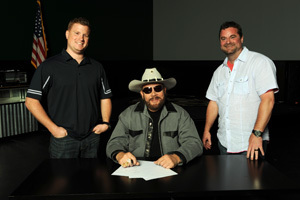 Mike Dennison, President of Blaster Entertainment, Hank Williams, Jr. and Tom Porter, CEO of Blaster Entertainment, sign exclusive agreement to distribute Hank's new CD. Nashville, TN (April 4, 2012) – Blaster Entertainment, one of the country’s leading talent management and entertainment labels, and award-winning Country music recording artist Hank Williams, Jr. announced that they have entered into a worldwide exclusive three year licensing agreement. The new partnership comes only months before Williams’ highly anticipated new studio album release, which will hit retail in June. The deal, which was signed this week, licenses Blaster Records, a division of Blaster Entertainment, to distribute Bocephus Records’ new release for the next three years. With more than 70 albums to his credit, sales of 55 million records, countless awards including 5-time Entertainer of the Year awards (ACM & CMA), BMI Icon Award, a Grammy, and most recently in 2009 the Academy of Country Music “Pioneer Award,” Williams is a living legend. His discography chronicles a bold profile of growth from adored offspring of a legendary father, to titan of the modern country rock movement in his own right. For two decades, America came to its collective feet each fall Monday night when this larger than life superman of a musician looked into the camera and unleashed the national anthem for viewers of Monday Night Football – ‘Are You Ready for Some Football. ?’ Those simple words have won Williams an entirely new generation of fans and given him the distinction of being the first country performer to ever win an Emmy. Blaster Entertainment is known for their unconventional, untraditional and by most people’s perception just plain fun way of doing business. The blending of Blaster and Williams is a perfect pairing. The mission of Blaster Entertainment is to service and support artists in all aspects of the business while creating new outlets for their music. The company prides itself on the ability to provide one-on one attention to all of their artists while developing new opportunities and alliances along the way. A partnership with a combination, promotional and distribution arm seems to be the way to go nowadays. Hank Jr. was able to stay in the news with, so-called controversy and right or wrong, he stuck to his guns and has to be admired for that.